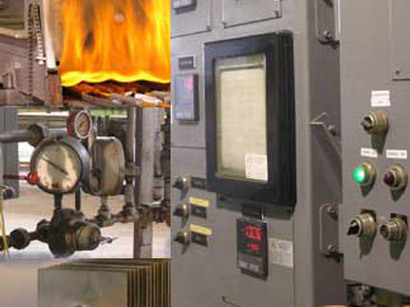 Our atmospheric brazing furnace is the heart of the operation. 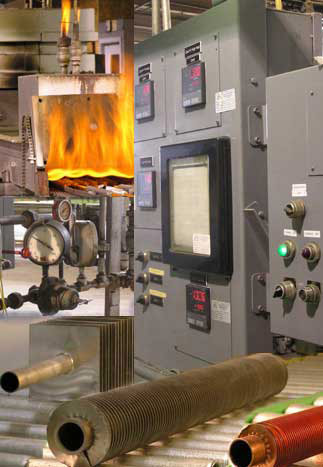 Being in house we have complete control over the many factors involved in the brazing process. Time, temperature, gas flow, heat and cooling zones etc. must be maintained to insure our high quality brazed finned tubes. Brazing allows the use of similar or dissimilar tube and fin combinations. Copper, CuNi, Carbon Steel or Stainless Steel tubes can be matched with a fin surface of the same material or a completely different metal can be chosen for the fins. The use of different metals can enhance your heat transfer and reduce the overall unit weight. The fin to tube joint being uniform and non-porous helps prevent the trapping of impurities in the gas stream.